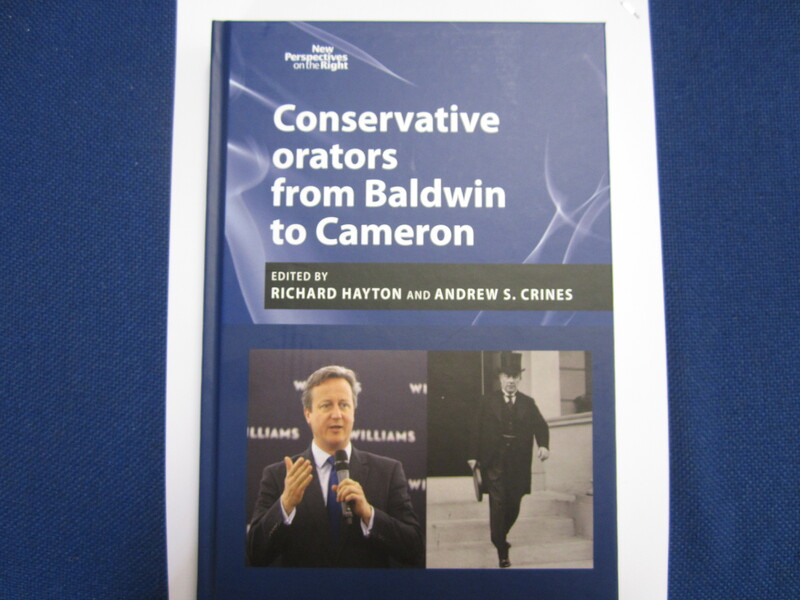 My paper on the oratory of Enoch Powell has now been published in the volume Conservative orators from Baldwin to Cameron, edited by Richard Hayton and Andrew S. Crines. In the chapter, I utilise the three modes that form the basis of the book: ethos, pathos and logos. Powell’s oratory was not characterised, as many believed, by pathos – of appealing to the emotions – but rather defined by ethos (appealing to character) and logos (appealing to logic). I address the impact he had, which may have been substantial in terms of mobilising support, but limited in terms of affecting policy outcomes. In the concluding paragraph, I quote Roy Lewis: ‘The principles and passion that made Powell a force in politics unmade his career as a man of office and power’. The book is published by Manchester University Press at, I fear, the princely sum of £75. This entry was posted in Uncategorized and tagged Conservative oratory, Enoch Powell. Bookmark the permalink. tizres: Many thanks. Well, I suppose I could offer a typescript of my chapter! I admire much of what you do and stand for, but, far more I envy your life access to many people I yearn to have had dinner with. J Enoch Powell being one of them. Some time ago I listened to this youtube interview of him on Desert Island Discs. How the woman who presented this show was so utterly out of her depth with a man who obviously had so much more to him than ever revealed, because of PC lunacy, is a tragedy of the modern world. She didn’t touch the depth of his soul at all. I too get moved by Wagner and his Rhine-Gold. Dinner with Powell would have been an incredible learning curve.